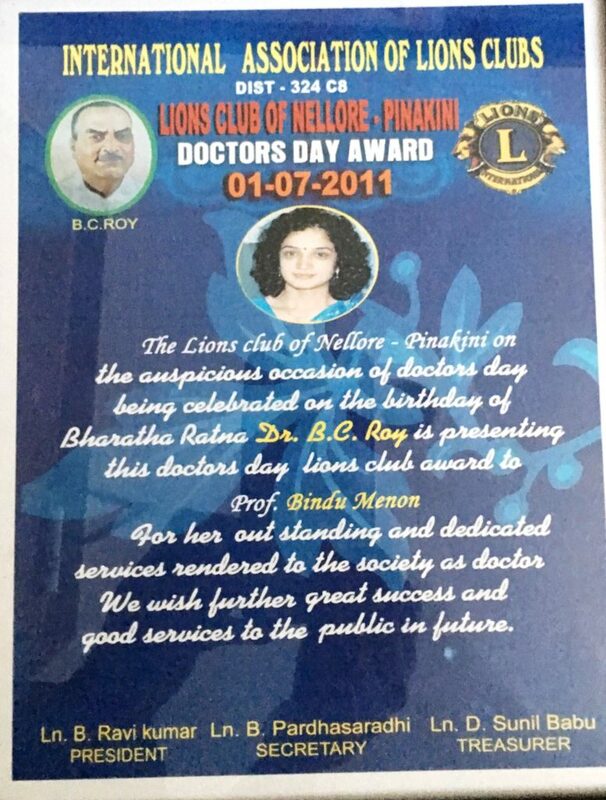 Mahatma Jyothirao Phule Foundation,Nellore invited me as Chief Guest to present International Women's Day Award-2018 to Prof Bindu Menon(DrBindu Menon Foundations) who is the head of the department and Senior Consultant Neurologist,Apollo Hospitals,Nellore...She also writes poetry in Hindi and English..Hence given The Poetry of South Asia Anthology as a gift in this occasion.. 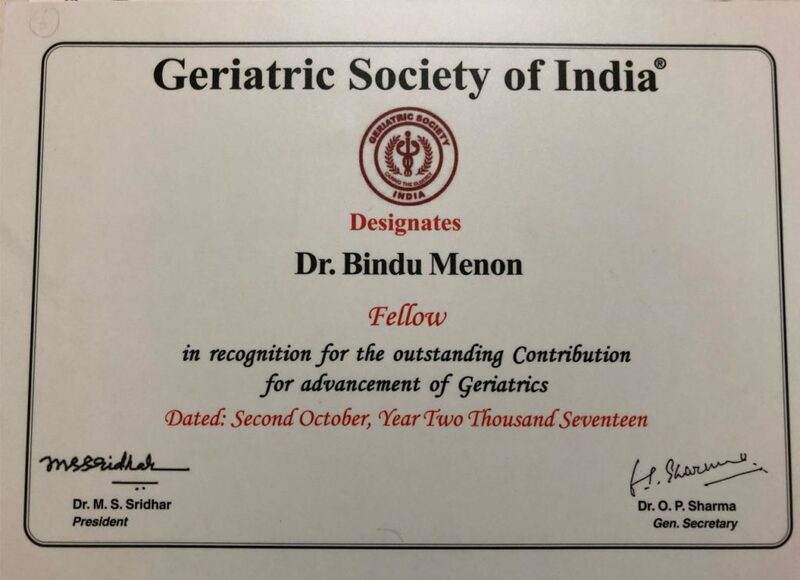 Awarded Fellowship of Geriatric society of India. 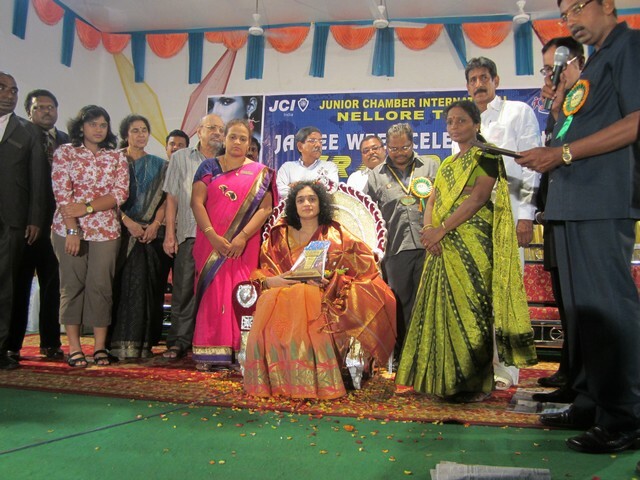 Conferred In the convocation ceremony of Geriatric society of India, GSICON 2nd October at Tirupati. 2017. Invited for lecture at the Walton center Postgraduate Medical Education, Lunchtime series on the Project “ Neurology on wheels” on April 10th 2019 Liverpool, UK. Awarded the Fellow of Royal College of Physicians from Royal College of Physicians on 28/6/2013. Awarded distinction and stood second in the Post graduate Diploma course in clinical Neurology from the Institute of Neurology and Neurosurgery, Queensquare, University College London, March 2006. 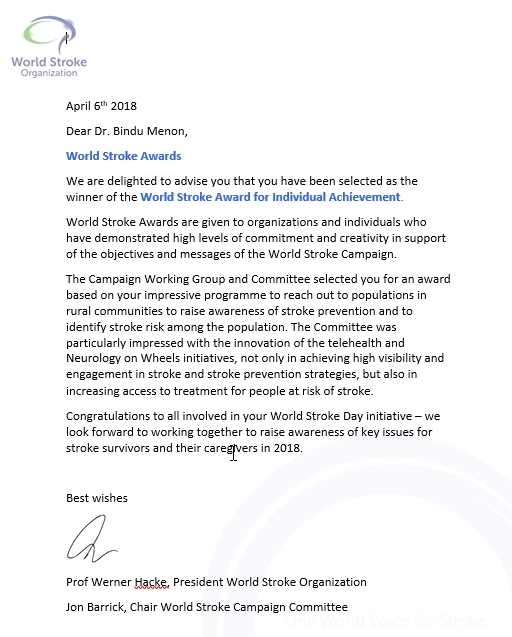 Honorary appointment to the research board of advisors by the Board of Directors, Governing Board of editors and publication board of the American Biographical Institute. Inclusion in the 10th Anniversary Edition of the ‘Marquis Who’s Who in Science and Engineering’, an exclusive directory distinguishing most accomplished people in their field. International Federation of Clinical Neurophysiology (IFCN) Fellowship from the American Association of Neuromuscular and Electrodiagnostic Medicine to attend the AANEM 53rd Annual scientific meeting to be held in Washington, October 11-14, 2006. 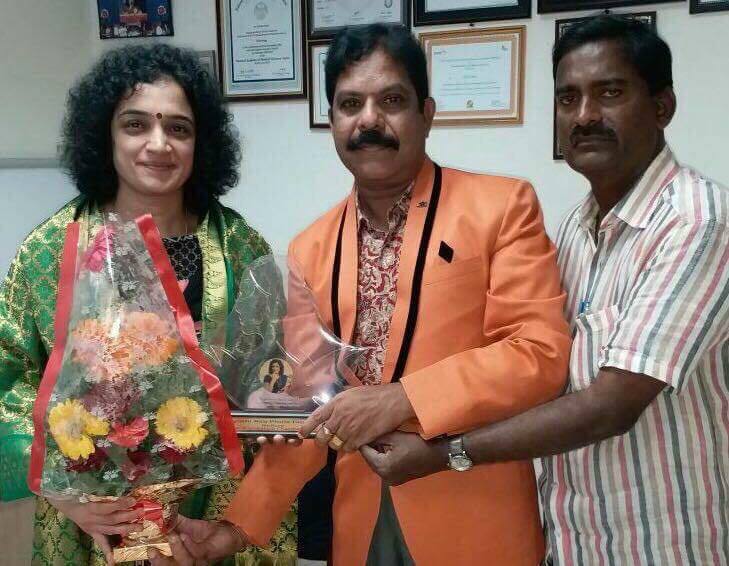 V Swapna, K A Parvathy, C V Harinarayan, U V Prasad, G Himabindu, Bindu Menon, B. Vengamma. 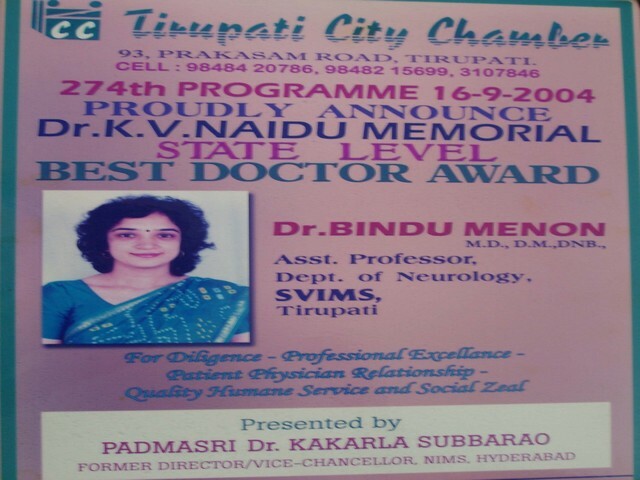 Effect of antiepileptic drugs on calcium and vitamin D. APSUM INTERNATIONAL SYMPOSIUM on Science in new millennium, Chennai, 12 -13th June 2006 was ranked among the first ten. 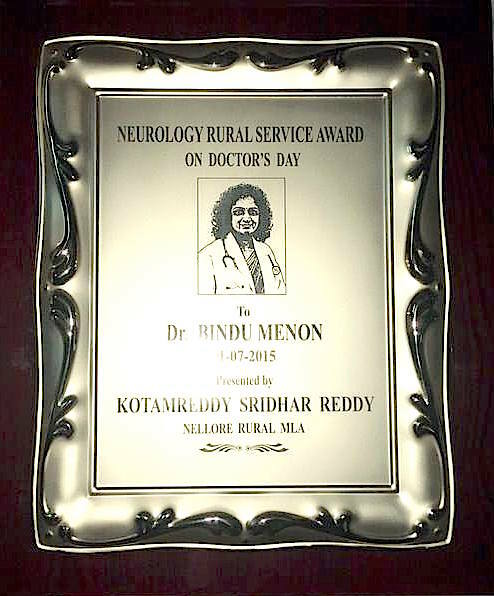 Received the Life Saver award from Dr. Prathap C Reddy for treating maximum number of stroke patients for the year 2017-2018 at Chennai on 5th February 2019. 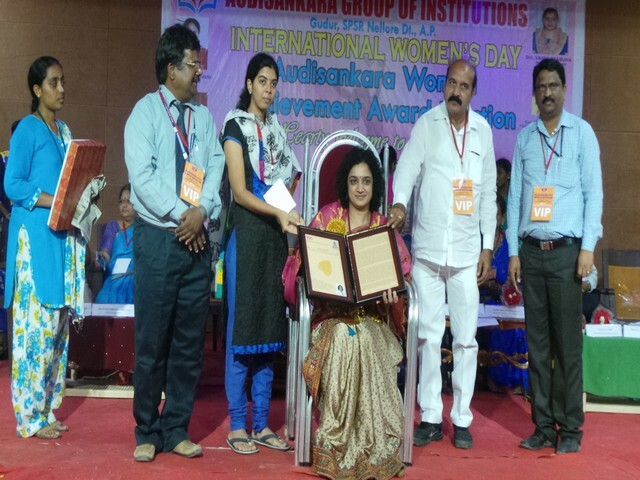 Received “Women’s Day Award” for Jyoti Rao Phule foundation on March 7th 2018 for International women’s day. Elected Fellow of Indian College of physicians (FICP) on February 24th 2018 at Bangalore annual conference of Association of Physicians of India. 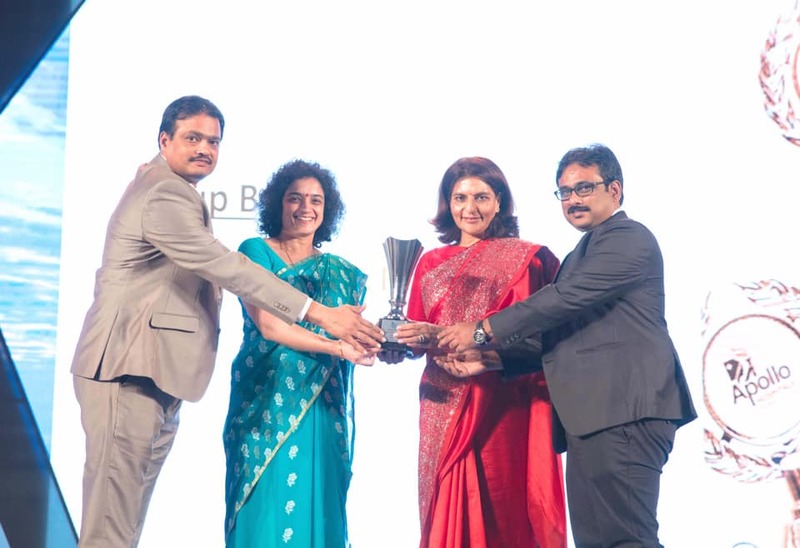 Conferred with the Honorary adjunct title of ‘DistinguishedClinical Tutor’ from Apollo Hospitals Educational and Research Foundation (AHERF), in recognition of contribution towards medical education and clinical training. Elected Fellow Geriatric Society of India. Conferred with the fellowship in the 14th International Conference on Geriatric care GSICON 2nd October 2017. Tirupathi, India. 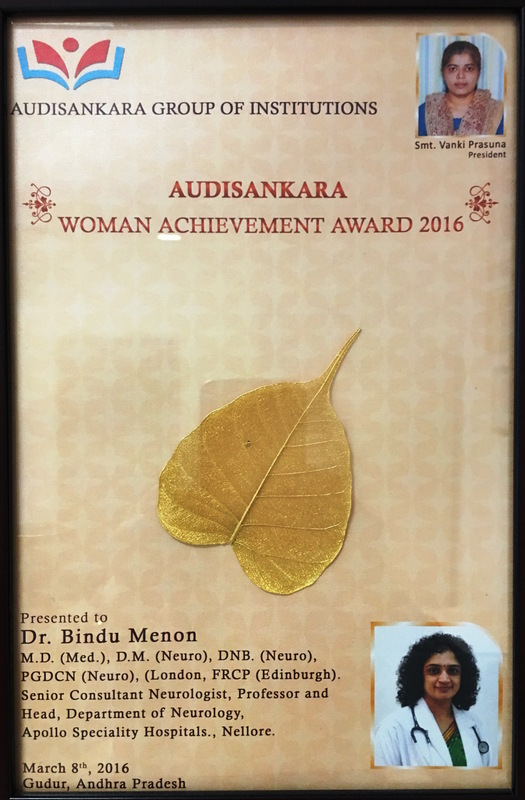 Received “Woman’s achievement Award” from Audisanakara Group of Institutions on occasion of “International Woman’s Day”. Has been conferred the prestigious “H. C. Bajoria oration” award in the 16th Joint Annual Conference of Indian Epilepsy Association and Indian Epilepsy Society, Feb 6-8th Chennai. 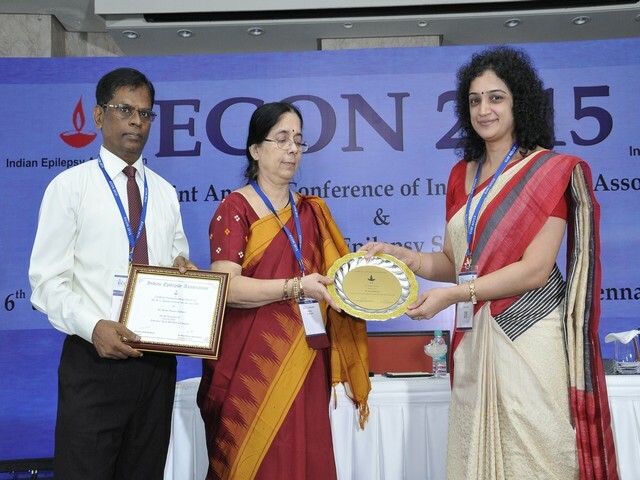 Best paper presentation in the 25th IAOMR national conference at Lucknow 18-20th 2013. 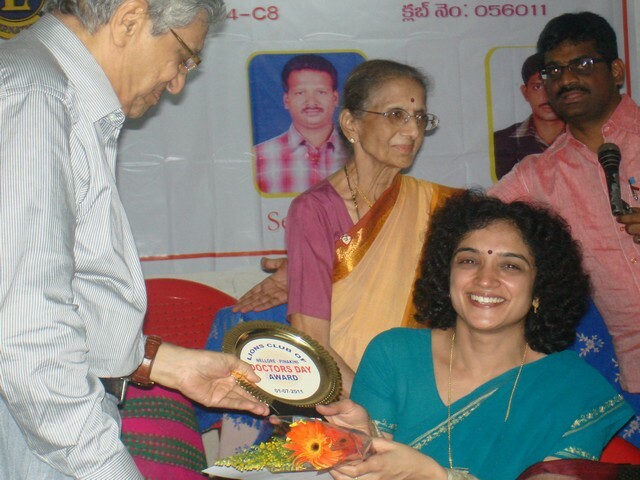 Vaidya Siromani award from the Ayya Vysya senior citizens association for social service in the field of epilepsy. On 29th September 2013. 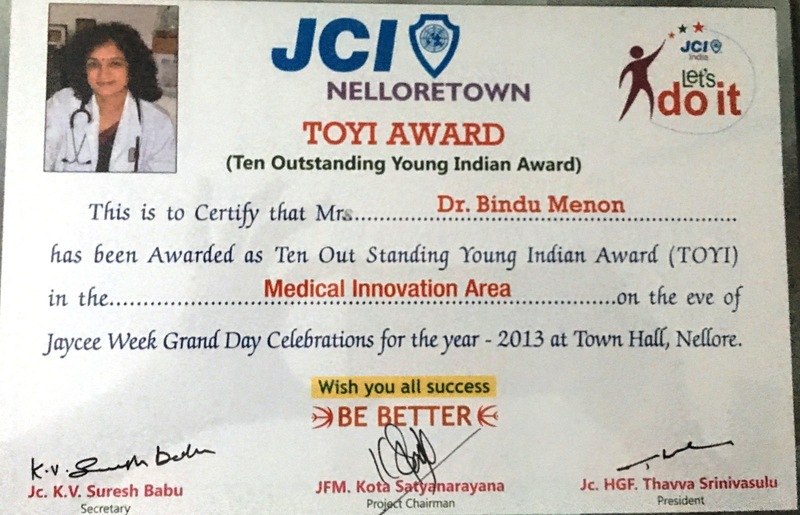 JCI Ten Outstanding Young Persons of the World(TOYP) for medical innovation on 15th September 2013. 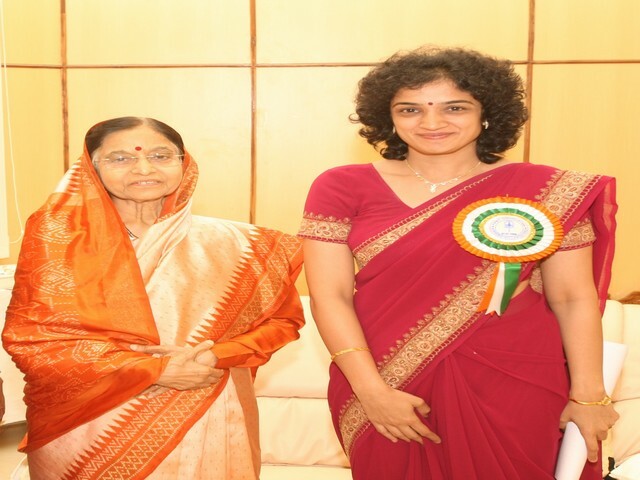 Awarded the ‘UGADI VAIDYA RATNA’ from the Sir C V Raman Academy on 3/3/13 at Ravindra Bharati bhavan, Hyderabad. 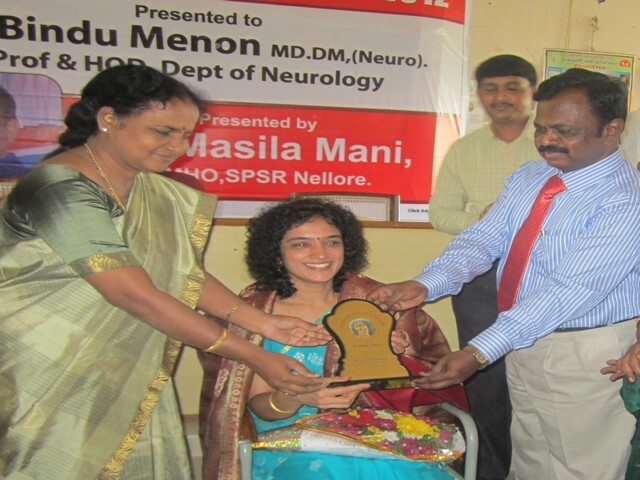 Awarded District level Epilepsy service award from the District Medical Health Officer on 26th December 2012. 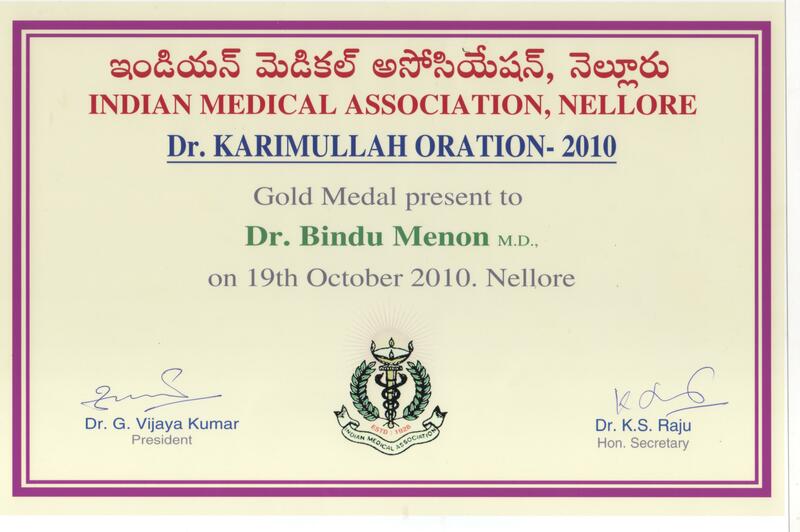 Awarded the Dr K V Naidu Memorial state level Best Doctor award for the year 2004. 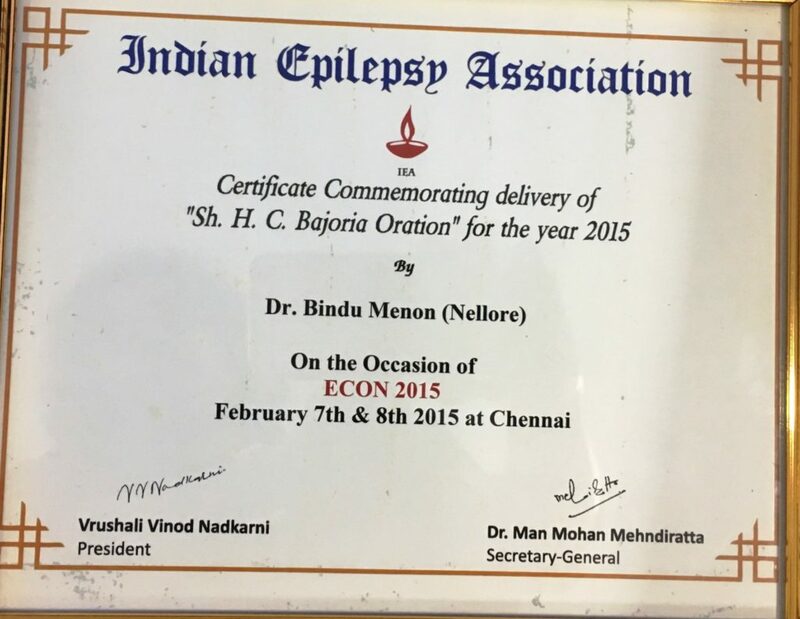 Awarded the 2nd prize for best poster presentation In CYTOCON 29th 2003, Pune. FELLOWSHIP OF OTHER NATIONAL MEDICAL ORGANIZATIONS. 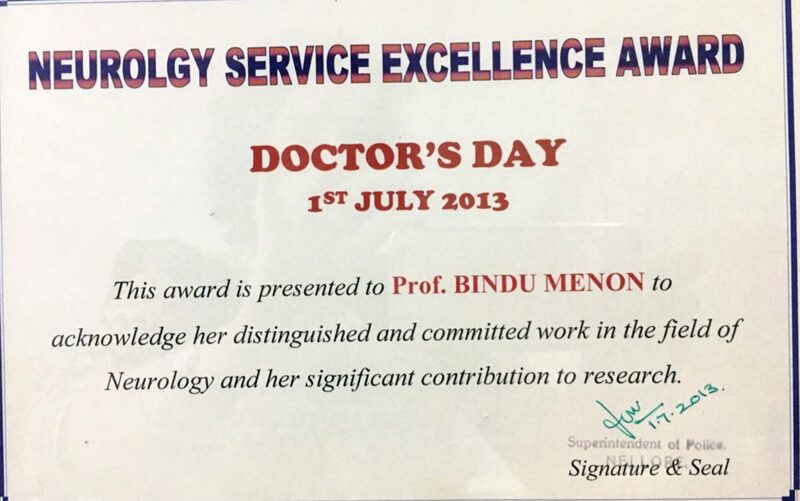 Fellow of Geriatric society of India. Conferred on October 2nd 2017 in the international conference of Geriatrics at Tirupati. 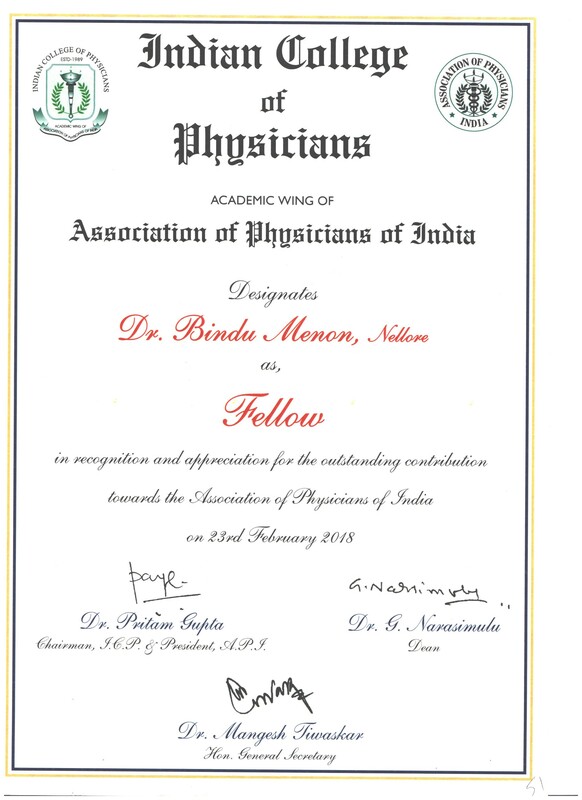 Fellow of Indian College of physicians in the annual conference of Association of Physicians of India in Bangalore on 23rd February 2018.